Sabarimala (Kerala)6/11/18:: A female devotee, 52, hailing from Thrissur, entered Sabirimala shrine and offered prayers on Tuesday despite resentment by protesters over her entry. The devotee. Lalitha, was opposed by protesters as they believed her to be within the age group of 10-50, but she was escorted by the police into the shrine after verification. Several media persons including a lens man of a Kerala based television channel were injured while covering the incident as the protesting mob allegedly attacked them.The temple reopened amid massive security arrangements on Monday for two days for special prayers. 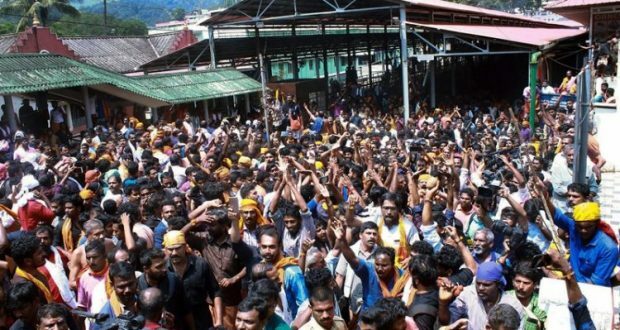 The Kerala high court has ruled that devotees and journalists should not be debarred from entering Ayyappa temple.he Pathanamthitta district administration has clamped prohibitory orders under section 144 Pamba, Nilakkal and other areas to prevent unlawful assembly. Strict vigil has been maintained in and around the shrine and vehicles heading towards the temple are being screened. In the wake of violent protests, the Kerala Police issued prohibitory orders at Pamba, Nilakkal and other areas near the shrine and maintaining vigil on vehicles going towards the temple. Strict vigil is maintained in Sannidhanam, Pamba, Nilakkal, and Elavunkal till November 6 to prevent any untoward incident, police said. Those found guilty of violating prohibitory orders and dare to engage themselves in rioting will be dealt with an iron hand and can be booked for a maximum period of three years, police said.